Community In the Know — Something to do? Somewhere to go? Valley Center's Dos Valles Garden Club judges get down to business at recent event. Water saving irrigation systems, anyone? The Dos Valles Garden Club will present a talk by Matthew Noreen of Grangetto’s in Valley Center on water-efficient technologies for landscape, vegetable and orchard irrigation. The presentation begins at 10 a.m., Tuesday Nov. 10 followed by the general club meeting. Included in this timely presentation, according to Sharon Grant, will be a discussion on MP Rotators, drip irrigation, Netafim Techline and water-smart controllers. Samples of the products will be available for viewing along with handout literature. The public is welcome to attend the monthly meetings of Dos Valles Garden Club, held at 10 a.m., the second Tuesday of most months at St. Stephen Community Hall, 31020 Cole Grade Road in Valley Center. The grand opening will be filled with art, music and an abundance of local artisanal coffee for attendees to try. The celebration also will showcase local music talent and offer complimentary cortados, a Spanish espresso with a small amount of warm milk, for visitors. The café is joining the growing artisanal coffee scene by using and selling coffee beans sourced from the renowned James Coffee Co., based in North Little Italy, San Diego. 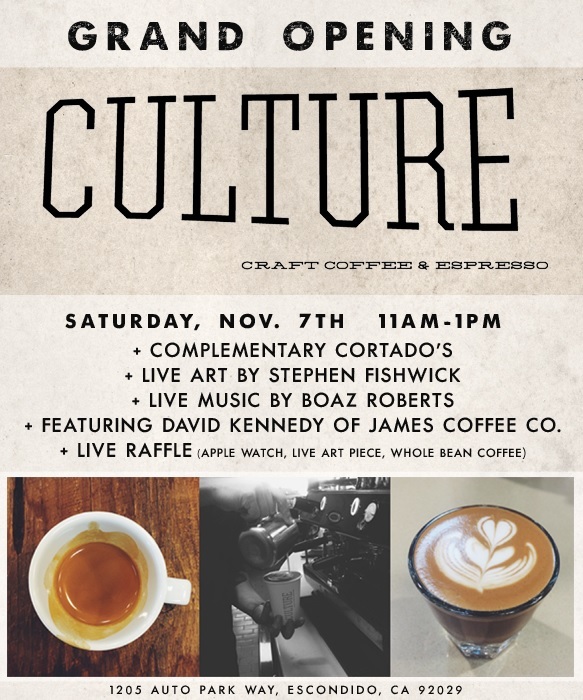 James Coffee Co. owner, David Kennedy, will be present at the grand opening event to discuss the different coffee blends and educate the attendees on coffee terminology. Stephen Fishwick Fine Art Gallery created the shop’s logo in addition to the art within the space. Fishwick and his team will perform a live art presentation at the event and art will be available for purchase throughout the event. The event is free and open to the public. For more information on CULTURE Craft Coffee and Espresso, please visit TheCentreEscondido.com/dine/culture-craft-coffee-espresso or Facebook.com/CultureCraftCoffeeEscondido. OK, it’s the Gilbert Castellanos Quartet here, but it’s close…. Escondido Public Library’s 2nd Saturday Concert Series presents the fiery Latin jazz of the Gilbert Castellanos Trio at 3 p.m. Saturday, Nov. 14 at the Turrentine Room. Trumpeter Gilbert Castellanos leads the trio of notable and accomplished musicians. He has won San Diego Music Awards (SDMAs) for Best Jazz three years in a row and has performed with such stars as Charles McPherson, Dizzy Gillespie, George Benson, Diana Krall, Al Jarreau, Wynton Marsalis, and Dr. John. Emmy-winning pianist and composer Irving Flores has performed with Abraham Laboriel, Alex Acuña, and the Spanish Harlem Orchestra. Percussionist Tommy Aros has performed with Freddie Hubbard, Charo, and is a member of the popular band Fattburger. Celebrate the holidays with the 2nd Saturday Concert Series presentation of Courtly Noyse at 3 p.m. Dec. 12 at the Turrentine Room. Courtly Noyse features Renaissance music and instruments, and lively stories. The 2nd Saturday Concert Series is sponsored by Friends of the Escondido Public Library. Escondido Public Library is located at 239 South Kalmia Street, Escondido, CA 92025. For more information, call (760) 839-4839 or visit Escondido Public Library online at library.escondido.org. Gold Coast Festivals has partnered with the San Diego Department of Parks and Recreation to bring this festive family event to San Diego County. Travel back to a time of gallantry and courtliness – of a rebirth of the arts, education and music. 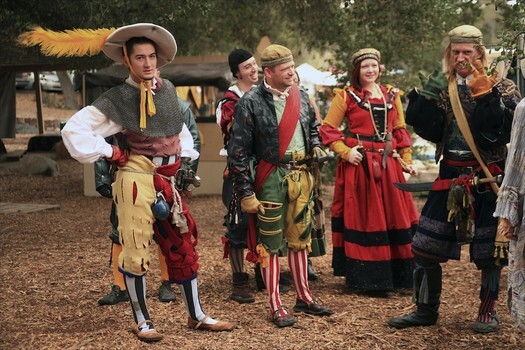 The Faire will recreate the Elizabethan era of 16th century England, offering a vast array of activities, including three stages of continuous entertainment, period music, battle pageants, Pirate Village, renaissance arts & crafts, merchants, children’s games and an assortment of themed food and drink (think ale and enormous turkey legs).